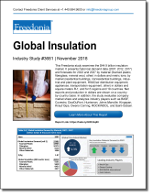 This study analyzes global supply of and demand for insulation. Historical data (2007, 2012, and 2017) and forecasts for 2022 and 2027 are provided for insulation demand by material (in dollars and metric tons) and market (in dollars and square meters R-1), net exports (in dollars), and production (in dollars) on a country-by-country basis. Demand in value terms is shown at the manufacturers’ level and excludes distributor and retailer markups. Both thermal and acoustic insulation are included in the scope of this study. The metric measures of thermal value used in this study cannot be converted to English units (those used in the Freedonia Group’s US insulation studies) simply by converting square meters to square feet. The metric version of thermal value defines heat transfer in metric units (watts) and is based on a material sample one meter thick; the English version of thermal value defines heat transfer in British thermal units and is based on a material sample one inch thick. Taking into account all of the differences in measurement, approximately 16.4 square meters of R-1 value (metric system) is equal to 1,000 square feet of R-1 value (English system).